Warframe's next update, The Second Dream, is going out to PC players sometime between tomorrow and Thursday, and developer Digital Extremes has sent PC Gamer a rundown of the big additions in what it calls the “largest and most ambitious” update so far for the free-to-play action game. The main thing is the first ‘cinematic’ quest—that is, the first quest with full cutscenes, voice over, and motion capture—which tells the story of “Tenno hunted by ghosts of the past through remnants of the Orokin’s lunar facilities.” According to Digital Extremes, it will finally answer the question: “What is a Warframe?” (It's what you put war pictures in, obviously.) New players will need to bulk up before attempting the quest, but experienced Tenno can play it as soon as the update is live. Also coming are a new PvP map, Orokin Moonbase, and ‘Sortie Missions,’ a set of endgame missions which will cycle every day. “Each Sortie Mission will have its own unique requirements or enemy modifiers, favoring Tenno that have a versatile Arsenal,” says Digital Extremes. Completing all three daily missions earns players a reward, and the pool of rewards will change every 15 days when a new Sortie season begins. Next up, The Second Dream adds a new Warframe, Ivara, whose archer theme comes with Hawkeye-like trick arrows: a Cloak Arrow which hides and shields allies in a bubble, a Dashwire Arrow that fires a zipline, a Slumber Arrow to make enemies sleepy, and an Intrigue Arrow which attracts enemies with a noise. The sound of an iPhone vibrating always perks me up, if they’re looking for suggestions. 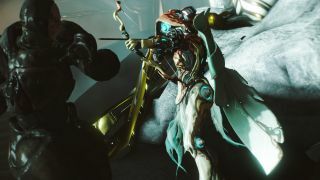 Ivara also has the Navigator ability, which lets her take control of an arrow and guide it, the Prowl ability, when makes her invisible and increases stealth damage, and the Artemis Bow, a summoned weapon that fires a volley of arrows. Rhino Charge can now gore enemies caught in his path. Rhino Charge now has a re-cast combo counter (mechanically identical to Valkyr's Ripline and Atlas' Landslide). Duration mods no longer affect Rhino's Charge. Range mods will now affect Rhino Charge's distance. Rhino Charge’s distance is now based on his melee combo meter. Rhino Charge will now result in a Blast proc on targets if Iron Skin is active while Charging. Rhino Charge will deal double damage against targets affected by Rhino Stomp. Iron Skin has damage absorb period at beginning and is affected by armor, like Snow Globe and Tectonics. Fixed 'double getup' when enemies affected by Rhino Stomp get ragdolled. Rhino Stomp is recastable now and picks up new enemies in range.